This application allows to mirror the screen of your iPhone or iPad to any Samsung Smart TV. No wires and no additional hardware needed! 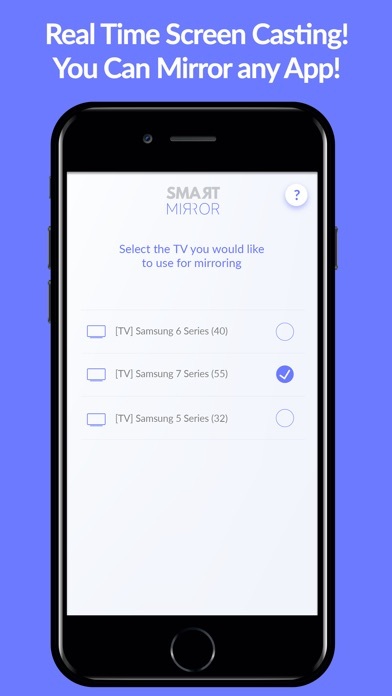 You can mirror any app or content on your iPhone or iPad to your Samsung TV. HOW TO USE: 1. First of all, make sure that your iPhone or iPad is connected to the same local network as your Samsung TV. Don't use multiple VLANs or subnets. 2. Open "Settings" on your iPhone/iPad, then tap "Control Center". 3. For iPhone: please turn on "Access Within Apps", then tap "Customize Controls". For iPad: please tap "Customize Controls". 4. 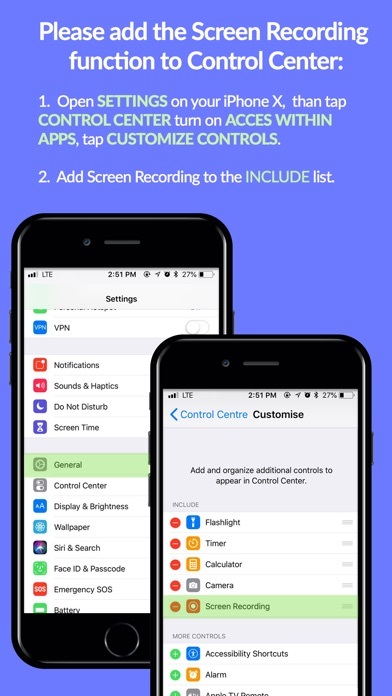 Scroll down and look for "Screen Recording" from the "MORE CONTROLS" list. Then tap the green '+' button to add the "Screen Recording" control to the "INCLUDE" list. 5. On iPhone X / XS / XR, swipe down from the upper-right corner of the screen to open "Control Center". On iPhone/iPad, swipe up from the bottom edge of the screen to open "Control Center", then Long Press / Force Press / 3D Touch the "Screen Recording" control (NOT "Screen Mirroring") to open the app list. 6. Scroll up/down and find "Smart Mirror" in the list, then select it and tap "Start Broadcast". 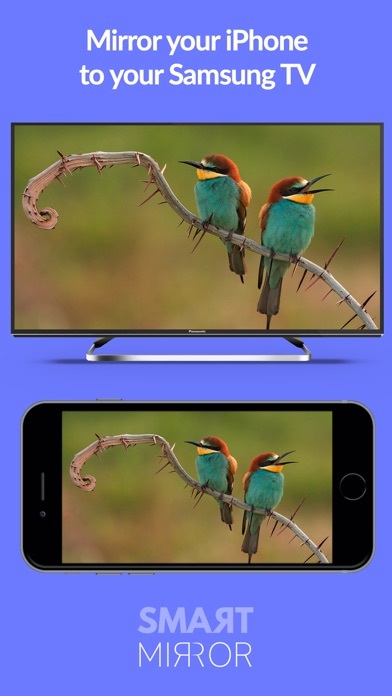 FEATURES: • Mirror your iPhone/iPad screen to your Samsung TVs or devices. • Supports Samsung TVs, Samsung Blu-ray players, and various Samsung devices (manufactured in 2012 and later). • Supports both portrait and landscape orientations for screen mirroring. • Consumes fewer resources, so your iPhone/iPad won't run slowly during screen mirroring. KNOWN ISSUES: • You will experience a latency (usually between 1 and 5 seconds) on your TV screen during mirroring; it is impossible to achieve zero-second latency which makes it unsuitable for gaming. However, it is very suitable for watching movies, giving presentations, watching photos, and much more! • DRM-protected content can't be mirrored, e.g., Netflix video. • Video stream only, no sound. How do you request a refund? I want my money back ,how to do this? Does anyone knows how to take my money back? So much lag and no sound is sent to TV. It does get the picture tot he screen but is 5-10 delayed. Don’t buy. App doesn’t work at all! This app seems to require an Apple TV device to screen mirror. Something that the developer neglected to mention. Can it work with a Fire stick? Is there a link for a refund?